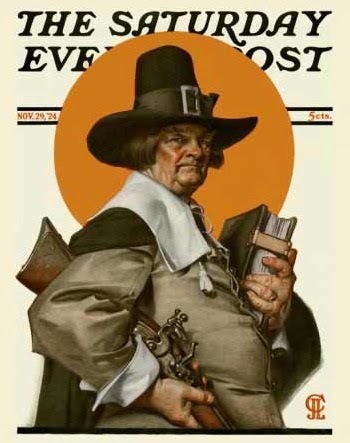 At the left is J.C. Leyendecker's cover for the Saturday Evening Post on Thanksgiving 1924. And gazing at it this morning, I was struck by how it captured something essential to our vision of the holiday - and ourselves. A white man, fat as a turkey. With a gun. And a Bible - locked shut. Sigh. Somehow I think this great gay artist was choking back bitter laughter as he served up what the Post's conservative public was hungry for. I only wonder whether he realized how enduringly relevant his image would turn out to be. For has anything changed all that much in America in 2014? We're still struggling with this vision of ourselves - perhaps more than ever. So here's my Thanksgiving prayer at the Hub Review - that someday (and sooner rather than later!) this image will feel like a relic. That would truly be something to be thankful for.